It seems that the theory of vulgar individualism and fetish corruption has triumphed over the political firmness and sharpness of the leadership of the ANC in defending its political line and organisational discipline, and, thus, of the entire society. By POPO MAJA. The more I read the Complete Works of Lao Tzu and embrace his teachings, the more the scattered parts of my political thought fall into place and become a seamless whole. Analysis of the situation at hand seems effortless as my heart opens up to the views of all the people in my life. I have time for everything worthwhile, even to think before I act or speak. My mind becomes empty of preconceptions as it becomes transparent and serene. I embrace sorrow as much as joy and failure as much as success. I can easily act with integrity and compassion; and as a result I have come to trust life completely. “Turning and turning in the widening gyre; The falcon cannot hear the falconer; Things Fall Apart; the centre cannot hold; Mere anarchy is loosed upon the world”. It seems that the theory of vulgar individualism and fetish corruption has triumphed over the political firmness and sharpness of the leadership of the African National Congress in defending its political line and organisational discipline, and, thus, of the entire society. This does not, however, establish catastrophism as some sort of messianic truth. As we know, equilibrium by its very nature is unstable. Unthinkable events and countervailing tendencies, which among other things create social stress and sombre mood in terms of political timing, are part of the dynamism of the reality of our life. Do not look only at yourself, and you will see much. Do not justify yourself, and you will be distinguished. Do not brag, and you will have merit. Do not be prideful, and your work will endure. The great leader is he who the people say, “We did it ourselves”. I agree with Antonio Gramsci that “the entire science and art of politics are based on the primordial fact, in that there really do exist rulers and ruled, leaders and led”. Sustaining his thought, it will have to be considered how one can lead most effectively; how leaders may best be prepared to be leaders, and how they can tell the lines of least resistance from the rational lines along which they should proceed to secure the consent and admiration of the led or ruled. Respect and obedience must be earned and solicited. Understanding of this principle and its strict observation by those who are charged with leading is necessary. This distinguishes a true leader from those who think that they are bigger than the organisations that made them, and whose weaknesses are the hardest to correct. In honour of the history of our liberation struggle and the future of the country, we need servant leadership. Leaders cannot expect that respect and obedience must be automatic and that their decisions and actions must be followed without question. Servant leaders must be accountable to the people they lead, and by so doing, accept public scrutiny but not personalised insults and be prepared to explain their political actions and inactions at all times instead of hiding behind conspiracy theories. Common sense dictates that the majority of “collective (political) disasters” occur because no attempt is being made to avoid repeated political mistakes, or that there’s no consequent account for costly transgressions. As an MK soldier, my comrades and I were prepared for and capable of going for days without food because our leadership made an effort to explain the situation to us, and in some instances it was obvious that it was physically impossible for supplies to reach us. The political and organisational discipline was derived precisely from this necessity of explaining organisational action or inaction. In that way, staunch political training was made of a contingent of young leaders who refused to be run over by personal ambitions or dictatorial habits of people who did not have the interests of the struggling mass at heart. 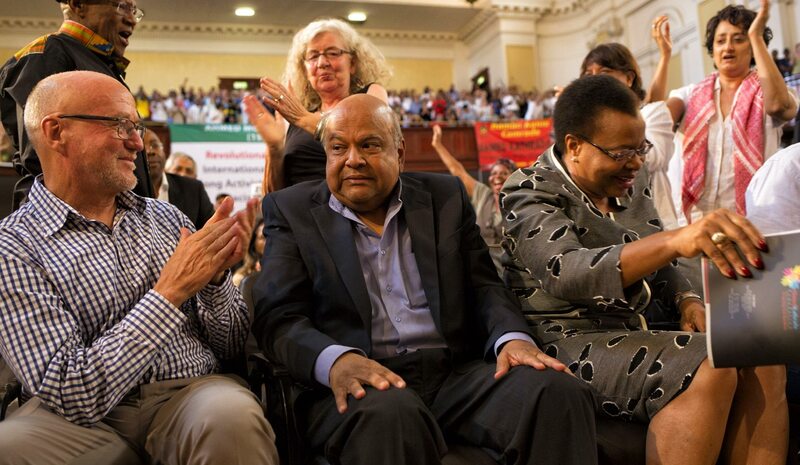 Although it seems that “Things Fall Apart” and that “the centre cannot hold”, as a cadre of the ANC, I still hold the strong conviction that there is a core of leaders within the ANC who are determined to bring back the soul of the organisation within the prescripts of our political principles that the ANC and MK were founded on. Put differently, the ANC worked hard for the democracy we enjoy today. By so saying, I implore our leaders not to allow our hard-earned gains to die because of brutish individualism. They need to examine scrupulously all political ideas and actions in the light of the needs of the country, ruthlessly fight against all tendencies which divert from consulting widely, and work tirelessly to unite us for the common good. I do not want to praise the dead in order to vilify the living, but Oliver Tambo’s hard work for organisational unity, even to the detriment of his health, must not be in vain. It was not for nothing that Nelson Mandela put the interests of the country and collective leadership of the ANC before his personal interest or position. It is in this very important sense that the lessons of the Rivonia Trialists and of the exiled leadership of Tambo in building an organisation that was destined to be the ruling party must be adopted and practised by all those who are prepared to lead. Political and organisational culture therefore cannot be abandoned for the convenience of individual interest. In an epoch where “politics of the stomach” is tempting, it is exactly on the questions of servant leadership and discipline for organisational work that political differences become explicit. Some people seem to regard the ANC as simply a contractual discipline to stop individuals from going off the rails as they react to class pressure. But it is more than that: leaders must become the servants of the people in word and deed – a true representative of the general interest of the country and shining example of paying allegiance to the country’s Constitution. In the current situation, differences of opinion can be allowed within the leading collective provided such differences do not set out to undermine the programme and policy of the ruling party and the Constitution of the country. In seeking to unite the membership and the country, the ANC needs to address the pressing issue of ethnicity in line with the founding creed of the ANC in 1912. To be seen to be selecting ministers and leaders of State entities from one ethical group is unfavourable to the historical objective of the ANC. We need to see to it that the experiences of the elders in the Struggle are utilised to educate a membership and citizens in the superiority of the servant leadership method; which is, essentially, the superiority of a democratic collective leadership. Popo Maja is a former MK soldier and Robben Islander. He is writing in his personal capacity.